Step into the Grand Tour! I remember the opening song to the Funimation dub of Dragon Ball GT well. That painful rap with little to no relevance to the actual show. I've taken the liberty of rewriting the theme to make it more fitting to the video game we are about to talk about. Witness the most awful battle. Between the most pixilated of warriors. Another challenge for Goku and his friends. 'Cause Webfoot's at the helm again. The Dragonballs can't save us, this game destroys all hope found within. This is sin. The ultimate battle between good and bad games, who's gonna win? Will our heroes have the strength to NOT BE AWFUL, WEAK AND LAME??!! And will they? As a matter of fact (or opinion, really), we're actually not looking at too bad a game here. It's like Webfoot blossomed into a beautiful ranunculus. Imagine if you will Streets of Rage with a Dragon Ball GT paint-job. Three playable characters you can switch interchangeably between, special moves and plenty of respect toward the source material. 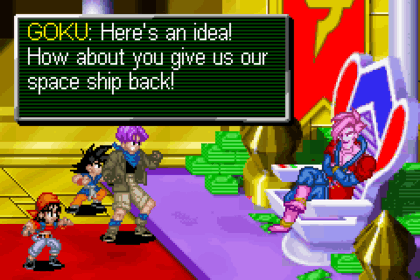 You can play as Kid Goku, Pan, and Trunks. Each character has their own stats and moves which differ the experience. Goku comes complete with his ki based moves, Trunks is equipped with his trusty sword, and Pan gets a robot companion in the form of Giru. Well, someone had to be lumped with that useless bag of bolts. Giru, Giru! Pan DANGER! DANGER PAN! Danger, DANGER!! The cutscenes are displayed in that lifeless mugshot and text format we've come to expect from cheaply produced licensed games. Grainy images, one or two expressions and what sounds to me like generic stock music. As for the game itself, well, I think this is actually not a bad attempt at all. The key word there being "attempt". The game features enough different scenarios to play, it even allows you to turn into Super Saiyan 4 and wallop Great Ape Baby with your signature move, the Kamehameha. But originally, Transformations was going to be in two halves. This was the first half, and the second part was to come the following year, instead focused on the (way more interesting) Shadow Dragons arc. 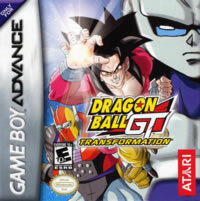 However, with the release of Nintendo DS and the lackluster success of Dragon Ball GT, the sequel pretty much vanished entirely. A rumour states that a finished sequel sits in either Atari or Webfoot's vaults. This sequel would have really improved on pretty much every facet of the experience. Most of all the story, because Aqueous Shenron is the best GT character of all time. After beating the game, you can play Single Player mode, which cuts out the story and allows you to play as a team of any three unlocked characters, including villain Super Baby Vegeta (not an actual baby) and Super Saiyan 4 Goku. And for that, I really can't fault the game. There is also the typical endurance mode, and a multiplayer mode starring only Piccolo and his doubles. A weird choice but there you go. This is pretty average. 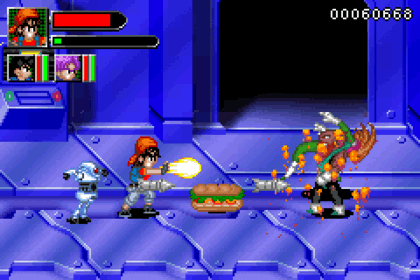 After having reviewed Dragon Ball Advanced Adventure, this game looks like trash in comparison. However for a small team, working under Atari, who previously made that insulting Taiketsu game, the improvements are staggering. Who knows just how good that sequel would have been? However, it's all been lost to the wind.